Lady of Infinite Light, which is as nice as it sounds as she saves souls. 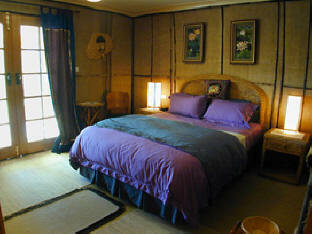 Stay in the Thai room and feel like you're tucked away in a bamboo bungalow. It features bamboo, rattan flooring and textured walls, also Thai silk wall hangings, handmade leadlight and a collection of Thai craftwork. Colours are purple and green, and Thailand has a queen sized bed. The ensuite is also has a Thai theme, and features ceramics made by a local artist. The private terrace overlooks the vineyard and mountains.